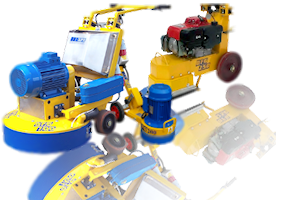 The DFG 200 has been developed as an introductory model to the SPE DFG Floor Grinder range of products. Available in 110v and 220v single phase electric models, the DFG 200 is simple to operate and meets the requirements of rental companies and flooring contractors alike. The operator handle height is fully adjustable and the machine easily fits into the boot of a car. Compact and powerful, the machine can be fitted with a wide range of diamond, polymer and PCD attachments making a very versatile grinding solution for smaller surface preparation projects.